In Which Ariana Goes to Hungary. Obviously. Breakfast for dinner is totally legitimate. These were such a brilliant idea, I could not believe I hadn’t thought of them before. The idea is very basic. 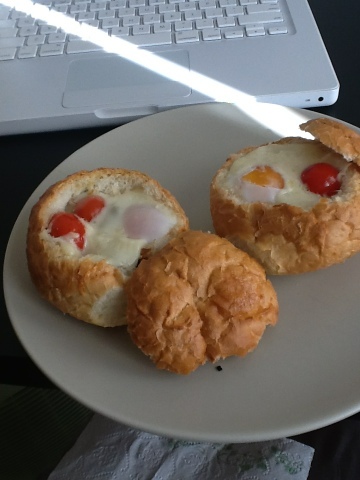 Take a hollowed-out stale bread roll, fill it with an egg, and bake it in the oven. Here I am blogging and eating dinner at the same time. Multitasking! Serves two generously, easily upscaled for more. The cheese is left up to you. I used Camembert because that’s the strongest-flavored cheese we can get here, but cheddar or gouda or feta would be great too. This filling is not the only option, either. I have also made these filled with cooked spinach and bacon, and it would work awesomely filled with all kinds of leftovers–hash browns, cooked vegetables, deli meats, etc. Preheat oven to 350° F. Cut the onion in two and slice thinly parallel to the equator to make long thin onion pieces. Heat the butter in a pan, and add the onions and a sprinkle of salt. After a few minutes of stirring, pour a few tablespoons of water into the pan to slightly soften the onions. Stir in sugar and balsamic vinegar and stir occasionally until onions are soft and brown and caramelized. Meanwhile, cook the bacon. Cut the tops off the rolls, and hollow out the insides. Put down a slice of cheese, 1/4 of the onions, and the crumbled bacon. Use a spoon to squish the fillings down so there is room for the egg. Crack an egg over the filling, making sure that it doesn’t overrun the sides. Season with salt and pepper. 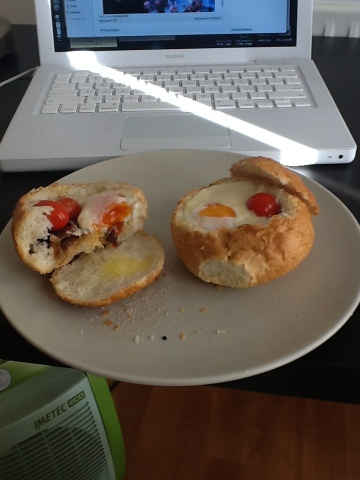 Tuck the tomatoes in next to the yolk and add a second slice of cheese on top, then replace the bread lid. Place the rolls on a baking sheet and put them in the oven for 10 minutes. Carefully remove the bread lid and cover the rolls with foil and cook for a further 10 minutes. Check that the whites are set (runny yolks are ok–it’s up to you), replace the bread lids, and serve. Definitely added to the must-try list!